The final report on a waste trade paint trial in the Australian state of Victoria is now available. 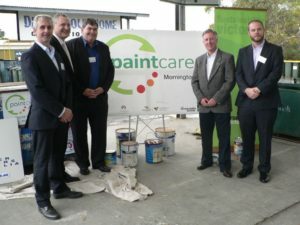 The trial was led by two Global Product Stewardship Council members, Sustainability Victoria (SV) and the Australian Paint Manufacturers Federation (APMF). From 31 March through to 31 August 2013, service provider Toxfree partnered with SV, APMF and the Master Painters Association to conduct the ‘PaintCare’ trial at six existing Detox Your Home sites for the purpose of collecting, managing and disposing of waste trade paint and providing previously unknown data on the potential volume of unwanted trade paint in the trade community, as well as behaviour patterns of participating trade painters. A total of 127.6 tonnes was collected and processed during the trial. Comparison of sales and recovery data provides an indication of a time lag between purchase and disposal. The data also shows that a higher rate of water-based paints will be likely in future collections.